A visually stunning and expanded release of the essential Windows Phone 7 Launch App is now available on Windows 8!The Harvest for Windows 8 features all the fun of the original game and adds exciting new synchronous multiplayer to the already intense action.In this science-fiction-themed action RPG set in a distant future, hostile aliens are out to turn Earth’s organic life into cyborgs. These aliens, known as The Harvesters, use humans and animals to create cyborgs: crude amalgamations of flesh and machinery. Thanks to the development of human controlled mechanized infantry units, you and the rest of mankind may finally have a chance to fight back. As a member of the Global Defense Force (GDF), you and your fellow freedom fighters have been deployed to various parts of the world to wage a war against The Harvesters in hope of restoring Earth to its rightful owners. 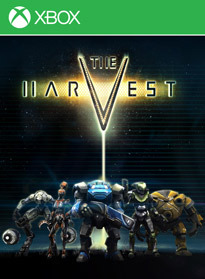 The Harvest game world provides not only visceral combat, but opportunities for exploration, character customization, and story progression. As you make your way through each challenge, you must not only fight off wave after wave of The Harvester horde, but find hidden upgrades, perform story actions, and defeat large and imposing enemy boss units in order to move on to the next challenge.